Richard Childress Racing in the NASCAR XFINITY Series at Watkins Glen International … In 24 XFINITY Series starts at the 2.45-mile road course, Richard Childress Racing has led 117 laps and visited Victory Lane once with Kevin Harvick in 2007. RCR averages a 13.3 starting position, an 11.6 finish and has accumulated five top-five and 12 top-10 finishes. Iowa Recap … In the U.S. Cellular 250, Brian Scott, Ty Dillon, Brendan Gaughan and Brandon Jones posted third, fourth, fifth and 20th-place finishes, respectively. The Points … All three RCR XFINITY Series full-time drivers remain in the top 10 of the driver point standings as the Series heads to Watkins Glen International for the 20th event of the season. Ty Dillon is currently third, Brendan Gaughan eighth and Brian Scott is ninth. The No. 33 RCR team is second in the owner point standings. Did You Know … Life threatening injury is the No. 1 killer of kids in America. Nearly 10,000 children lose their lives every year from serious injuries, and many more are treated in the emergency room. It can happen anywhere, at any time, to any child. The Childress Institute for Pediatric Trauma discovers and shares the best ways to prevent and treat severe injuries in children. The Institute funds research, education and advocacy to improve the care and treatment injured kids receive across the U.S. Visit SaveInjuredKids.org or find them on Facebook and Twitter to learn more. Social Media … To stay on track with the latest news and information and to view exclusive, behind the scenes content visit RCR’s Twitter account – @RCRracing, RCR’s NASCAR XFINITY Series team Twitter accounts – @RCR2BScott, @RCR3TDillon, @RCR33NNS and @RCR62BGaughan. RCR’s XFINITY Series driver twitter accounts – @bscottracing, @tydillon and @Brendan62. For additional photos, news and video log on to rcrracing.com. Catch the Action … Coverage of this weekend’s XFINITY Series event at The Glen will be televised live on Saturday, August 8, beginning at 3 p.m. Eastern Time on NBC Sports Network. It will also be broadcast live on the Motor Racing Network and SiriusXM channel 90. This Week’s Shore Lodge Chevrolet at Watkins Glen International … Brian Scott and his No. 2 Shore Lodge Chevrolet Camaro team will race chassis No. 126 this weekend at Watkins Glen International. This Richard Childress Racing-prepared chassis last raced at Texas Motor Speedway where Scott qualified fourth and finished sixth. This chassis has an average starting position of 6.7 and an average finishing position of 7.7 in the past four races competed. Watkins Glen Statistics … Scott will be making his sixth NASCAR XFINITY Series start at the 2.45-mile road course where he has earned two top-10 finishes, an average start of 13.4 and an average finish of 11.6. Scott has finished 14th or better in all five races, with 412 of 413 (99.8 percent) laps completed. 2015 at A Glance … After 19 XFINITY Series races this season, Scott has captured three top-five and 11 top-10 finishes, sits ninth in the driver point standings and has led 133 laps with an average starting position of 5.9 and an average finish of 14.5. According to NASCAR’s Loop Data Statistics, Scott currently leads the XFINITY Series drivers with the highest average starting position of 5.9. Summertime at Shore Lodge … Life is more exciting when you are on the water! Shore Lodge, located in spectacular McCall, Idaho, just 100 miles north of Boise, puts you right on the waterfront…literally! Right outside our guest rooms sits a 5,330-acre expanse of pristine glacial water known as Payette Lake. Swim, boat, water ski and lounge at the lake before retiring to one of our 77 luxurious guest rooms. Visit ShoreLodge.com or Call 800.657.6464 for reservations. Last Time in Watkins Glen … Scott and the No. 2 Shore Lodge Chevrolet Camaro qualified for the Zippo 200 at The Glen in the seventh position at Watkins Glen International. This 82-lap race was a game of strategy from the initial-green flag. The Boise, Idaho native picked up 12 positions in the final 20 laps crossing the finish line in 10th place. Iowa Race Rewind … Scott and the No. 2 Shore Lodge Chevrolet qualified in the 11th position for the U.S. Cellular 250 at Iowa Speedway. The XFINITY Series went 75 laps under green-flag conditions before being slowed for debris. To keep up with the changing track conditions going from daytime to nighttime, the Shore Lodge team utilized the first stop for four tires, fuel, wedge and track bar adjustments. Scott raced inside the top 10 for the majority of the first half of the scheduled 250-lap event. Two great pit stops on lap 146 and 205 put Scott in position to gain on the top-five teams. With two attempts at a green-white-checkered finish, Scott battled for position in the closing laps and captured a third-place finish for his third top five this season. Meet Scott … Scott is scheduled to appear at the XFINITY Series autograph session at Watkins Glen International in the Bog Hospitality inside Turn 11 on Friday, August 7 at 5:15 p.m.
Are you looking forward to the road course races? "I like the road course races. Watkins Glen has always been one of the faster road courses that we go to. You almost primarily do all right-hand turns. It’s a weekend where we get a lot of the NASCAR Sprint Cup Series drivers that use the XFINITY race to polish up and get ready for their race. It’s a tough competitive weekend, but it’s a lot of fun. I like the challenges of the road courses." How does Watkins Glen prepare you for the two road course races after? "Anytime you can get repetitions on a road course it helps. Just to be able to get yourself in the rhythm of shifting and all of the things you have to do different on a road course, than you do in an oval, is good." This Week’s Yuengling Light Lager Chevrolet at Watkins Glen International … Ty Dillon will pilot chassis No. 456 for this weekend’s Zippo 200 at Watkins Glen International. This Richard Childress Racing-prepared Chevrolet Camaro is new to the road course racing stable and will see track action for the first time on Friday during NASCAR XFINITY Series practice. Dillon in the XFINITY Series at WGI … Dillon has made one previous start at the 11-turn, 2.45-mile road course, finishing eighth. This will be Dillon’s sixth-career road course race. D.G. Yuengling & Son, Inc. partners with RCR for 2015 season … Yuengling Light Lager, the 99 calorie light beer produced by America’s Oldest Brewery, will be featured on the No. 3 Chevrolet Camaro during the 2015 season. Based in Pottsville, Pa., D.G. Yuengling & Son, Inc., is family owned and operated since 1829. Principal Beer brands include Traditional Lager, Light Lager, Premium, Light, Black and Tan, Dark Brewed Porter, and Lord Chesterfield Ale. For more information, visit www.yuengling.com. #RaceHardTy … Join the conversation on Twitter and Facebook every race weekend by using the hashtag #RaceHardTy and have the opportunity to win free Yuengling Light Lager swag. Last week at Iowa Speedway … Dillon collected his fourth top-five finish of the season last Saturday night at Iowa Speedway by finishing fourth. He qualified 10th and raced inside the top 10 for the entire 250-lap race. In the closing laps, Dillon improved his positioning with two aggressive green-white-checkered restarts. XFINITY Series Points Update … After 19 races, Dillon remains third in the XFINITY Series driver point standings, trailing second-place by only one point and first place by 21 points. Meet Ty Dillon … Fans will have several unique opportunities to meet Dillon this weekend. First, Dillon and grandfather/team owner Richard Childress are scheduled to appear at the historic Yuengling Brewery for its annual "BBQ at the Brewery" celebration on Thursday, August 6. Beginning at 11 a.m., fans can meet Dillon and Childress, have a hot dog, tour the 186-year-old brewery and shop in the gift store. On Friday, August 7, on behalf of Yuengling, Dillon is scheduled to appear at the Tops Market on 504 ½ S. Franklin Street, Watkins Glen, N.Y. beginning at 5:30 p.m. and Walmart Supercenter at 515 E. 4th Street, Watkins Glen, N.Y. at 6:15 p.m.
Last season, road course racing had its challenges for this team. How are your preparing this time around? "Road course racing has always been a fun part of the schedule because of its unique challenge. Last season, we ran into a few mechanical issues at Mid-Ohio and Road America and had a good finish at The Glen. I think we learned a lot from last season and we’re looking to redeem ourselves this time around. Each of these road courses have different challenges that I am fully prepared for. Earlier this year I was able to go out to Las Vegas and learn from a great road course racer, Ron Fellows, at his driving school at Spring Mountain. I learned a lot and I’m looking forward to putting my skills to test." This Week’s Richmond/Menards Chevrolet at Watkins Glen International … Paul Menard will pilot chassis No. 116 in the Zippo 200 at The Glen. This Richard Childress Racing-prepared Chevrolet Camaro is new for the 2015 season and has an average starting position of 5.7 and an average finishing position of eighth. Stats at The Glen … The Eau Claire, Wis., native driver has made eight NASCAR XFINITY Series starts at The Glen, collecting one top-five and five top-10 finishes. Menard has an average starting position of 10.9, an average finishing position of 12.4 and led for a total of three laps. Welcome Back, Richmond … Richmond®, a member of the Rheem family of quality brands, is committed to offering exceptional value and performance with a complete line of water heating products for residential environments. Known as, "the water heater experts," Richmond is the go-to brand for value-conscious buyers. Innovations including "Fast Recovery" technology for peak-time water use and EverKleen™ Self-Cleaning tanks make choosing Richmond products easy. Richmond water heating products are available in Menards® stores throughout the Midwest. For more information, visit http://ift.tt/17uRMaU. Rearview Mirror: Iowa … Last weekend, the XFINITY Series visited Iowa Speedway for the 18th race of the 2015 season. Brandon Jones qualified the FVP/Menards Chevrolet fourth for the scheduled 250-lap event. After running within the top 10 for the majority of the race, Jones made contact with another competitor on lap 231 and sustained damage to the No. 33 entry. The 18-year-old driver was able to finish the remainder of the event on the lead lap crossing the finish line in the 20th position. 33 Team by the Numbers … So far this season, the No. 33 team has accumulated some impressive stats with Menard, Austin Dillon and Brandon Jones. In 19 races, the RCR team has garnered three wins, five pole awards, 10 top-five and 14 top-10 finishes with 418 laps led. Looking Ahead … Following this weekend’s 82-lap affair, Brandon Jones will return to the driver’s seat of the No. 33 Chevrolet for the next two consecutive races at Mid-Ohio Sports Car Course and Bristol Motor Speedway. Double Duty … In addition to Saturday’s Zippo 200 at The Glen, watch Menard in the No. 27 Libman/Menards Chevrolet SS in the NASCAR Sprint Cup Series The Glen 355, which airs live on NBC Sports Network Sunday, August 9 at 2 p.m. Eastern Time. You raced at Sonoma Raceway earlier this year in the Sprint Cup Series event. What’s the difference there versus Watkins Glen International? "At a place like Watkins Glen there are better passing opportunities than somewhere like Sonoma. I think historically you see more wrecks at Sonoma, where at Watkins Glen you can get by a guy if you’re faster than him. It’s a fun road course and it can be really hard to pass. Obviously the harder it is to pass, the more track position means so you try to get all you can on the restarts. It has really high speeds and the setup is a lot different than you would run at Sonoma, which all makes for an interesting weekend." This Week’s South Point Hotel & Casino Chevrolet at Watkins Glen International … Brendan Gaughan will pilot chassis No. 109 this weekend at The Glen. This Richard Childress Racing-prepared Chevrolet Camaro is new for the 2015 season and has an average starting position of 8.6 and an average finishing position of 9.7. 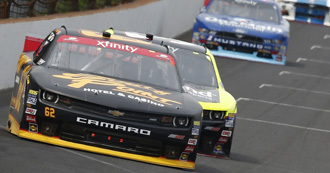 Upstate NY Details … In four NASCAR XFINITY Series starts at the 2.45-mile road course, Gaughan averages a starting position of 20.8 and finishing position of 23.5. The Las Vegas native best finish came in 2013 when he scored a 14th-place result. Welcome Home, Adam … No. 62 front end mechanic Adam Brown returns to his home state this weekend for the Zippo 200. The Rochester, N.Y.,-native grew up working on race cars and watching races with his dad. Brown made the move to North Carolina in 2004 and began working at RCR in 2010 as a full-time mechanic. The next year, Brown travelled with Ty Dillon in the ARCA Racing Series where they earned the drivers championship. This is Brown’s second year with the South Point team. South Point Hotel & Casino by the Numbers … Located in the heart of the new Las Vegas South Strip, South Point Hotel, Casino & Spa features 160,000 square feet of meeting, banquet and exhibit hall space, a 4,600 seat equestrian center, over 2,100 guestrooms, a 400 seat Showroom, a 200 seat sports book, 64 bowling lanes, 12 restaurants and a 16 screen movie theater. Find out more information at southpointcasino.com. In the Rearview Mirror: Iowa Speedway… Gaughan qualified in the third position for the U.S. Cellular 250 at Iowa Speedway. This marked Gaughan’s 14th top-10 starting position of the season. The No. 62 South Point Hotel & Casino Chevrolet raced in the top five for the majority of the scheduled 250-lap event and raced his way to second place in the final 40 laps, putting himself in contention to compete for the race lead. After taking the green flag on the first attempt at a green-white-checker, Gaughan went for the lead going into Turn 1 but got loose and slipped to the sixth position. He was able to improve one position, to fifth, before taking the checkered flag. To the Points … As the Series travels to upstate New York, Gaughan and the No. 62 South Point Hotel & Casino team remain eighth in the driver point standings. Tune in Alert … Tune into "Dialed In" with Claire B. Lang on SiriusXM channel 90 at 9 p.m. ET. on Thursday, August 6 when Gaughan will be a guest on the show. How is Watkins Glen International different than other road courses? "Watkins Glen has so many fast corners. The bus stop is basically a corner built into chaos. You have to let the car roll as hard as humanly possible. It is a place on that course where you can’t gain that much position, but you can lose a ton. Many other road courses are much more speedway fast, motor-wise, while The Glen is faster with corner speeds."